, a distinguished general, was descended of a noble family in Germany, and waa | the son of count Schomberg, by his first wife, an English lady, daughter of the lord Dudley; which count was killed at the battle of Prague in Bohemia in 1620, together with several of his sons. The duke was born in 1608. He served first in the army of the United Provinces, and afterwards became the particular confident of William II. prince of Orange; in whose last violent actions he had so great a share, and particularly in the attempt upon Amsterdam, that, on the prince’s death in 1650, he retired into France. Here he gained so high a reputation, that, next to the prince of Conde, and Turenne, he was esteemed the best general in that kingdom; though, on account of his firm adherence to the Protestant religion, he was not for a considerable time raised to the dignity of a marshal. In Nov. 1659 he offered his service to Charles II. 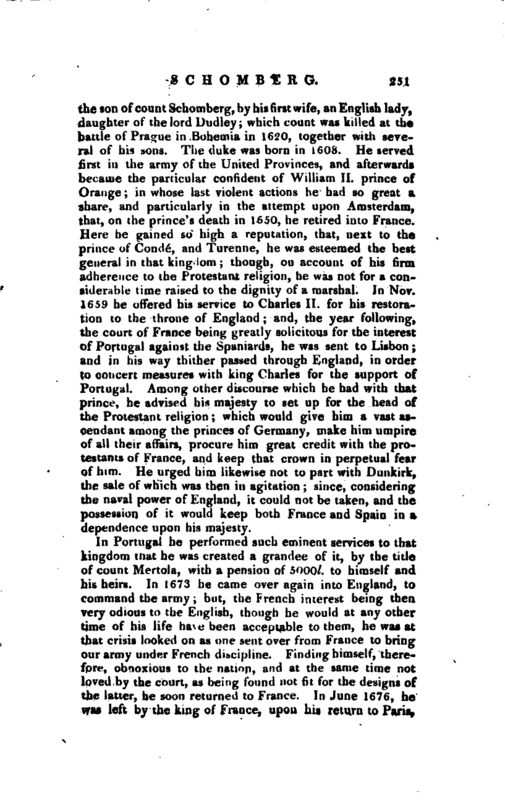 for his restoration to the throne of England; and, the year following, the court of France being greatly solicitous for the interest of Portugal against the Spaniards, he was sent to Lisbon; and in his way thither passed through England, in order to concert measures with king Charles for the suppoxt of Portugal. 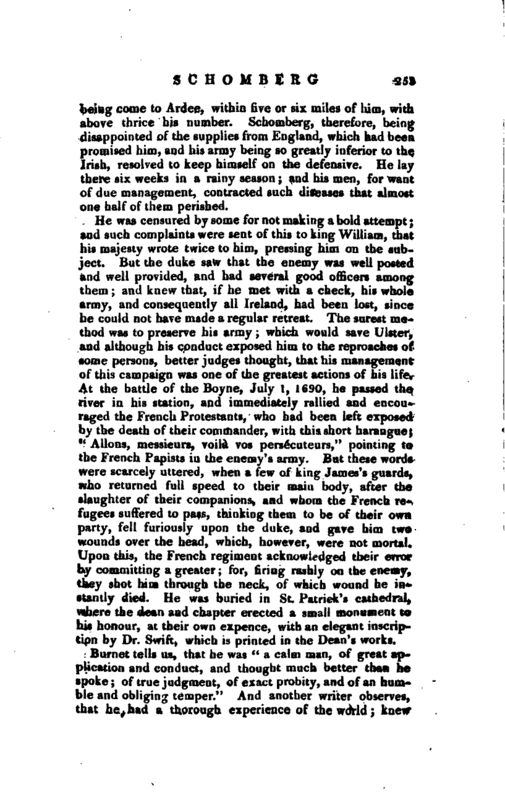 Among other discourse which he had with, that prince, he advised his majesty to set up for the head of the Protestant religion; which would give him a vast ascendant among the princes of Germany, make him umpire of all their affairs, procure him great credit with the protestants of France, and keep that crown in perpetual fear of him. He urged him likewise not to part with Dunkirk, the sale of which was then in agitation; since, considering the naval power of England, it could not be taken, and the possession of it would keep both France and Spain in a dependence upon his majesty. In Portugal he performed such eminent services to that kingdom that he was created a grandee of it, by the title of count Mertola, with a pension of 5000l. to himself and his heirs. In 1673 he came over again into England, to command the army; but, the French interest being then very odious to the English, though he would at any other time of his life have been acceptable to them, he was at that crisis looked on as one sent over from France to bring our army under French discipline. Finding himself, therefore, obnoxious to the nation, and at the same time not loved by the court, as being found not fit for the designs of the latter, he soon returned to France. In June 1676, he was left by the king of France, upon his return to Parisy | with the command of his army in Flanders; and soon after obliged the prince of Orange to raise the siege of Maestricht, and was made a marshal of France. But, when the prosecution against those of the reformed religion was begun in that kingdom, he desired leave to return into his own country; which was denied him, aud all the favour he could obtain was to go to Portugal. and, though he had preserved that nation from falling under the yoke of Castile, yet now, when he came thither for refuge, the inquisition represented that matter of giving harbour to an heretic so odiously to the king, that he was forced to send the marshal away. He went thence to England; and, passing through Holland, entered into a particular confidence with the prince of Orange; and, being invited by the elector of Brandenburgh to Berlin, was made governor of Prussia, and placed at the head of all the elector’s armies. He was treated likewise by the young elector with the same regard that his father had shewn him; and, in 1688, was sent by him to Cleves, to command the troops which were raised by the empire for the defence of Cologne. 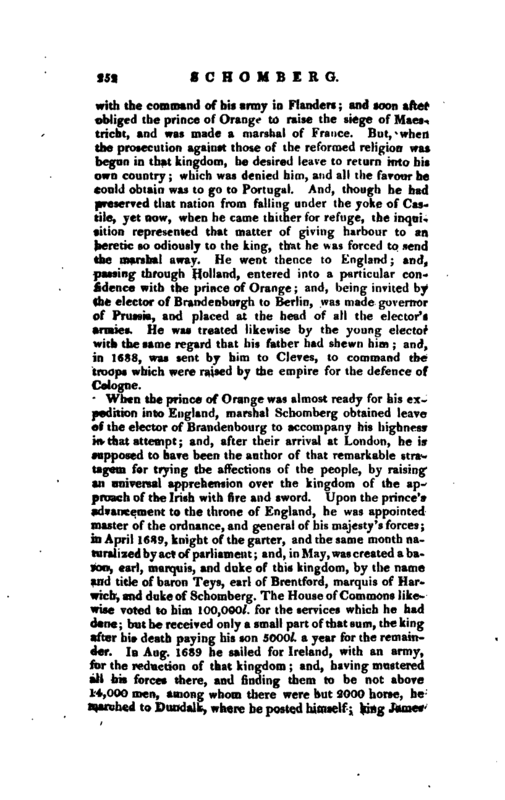 When the prince of Orange was almost ready for his expedition into England, marshal Schomberg obtained leave of the elector of Brandenbourg to accompany his highness in that attempt; and, after their arrival at London, he is supposed to have been the author of that remarkable stratagem for trying the affections of the people, by raising an universal apprehension over the kingdom of the approach of the Irish with fire and sword. Upon the prince’s advancement to the throne of England, he was appointed master of the ordnance, and general of his majesty’s forces; in April 1689, knight of the garter, and the same month naturalized by act of parliament; and, in May, was created a baron, earl, marquis, and duke of this kingdom, by the name and title of baron Teys, earl of Brentford, marquis of Harwich, and duke of Schomberg. The House of Commons likewise voted to him 100,000l. for the services which he had done; but he received only a small part of that sum, the king after his death paying his son 5000l. a year for the remainder. In Aug. 1689 he sailed for Ireland, with an army, for the reduction of that kingdom; and, having mustered all his forces there, and finding them to be not above 14,000 men, among whom there were but 2000 horse, he marched to Dundalk, where he posted himself; king James | being come to Ardee. within five or six miles of him, with above thrice his number. 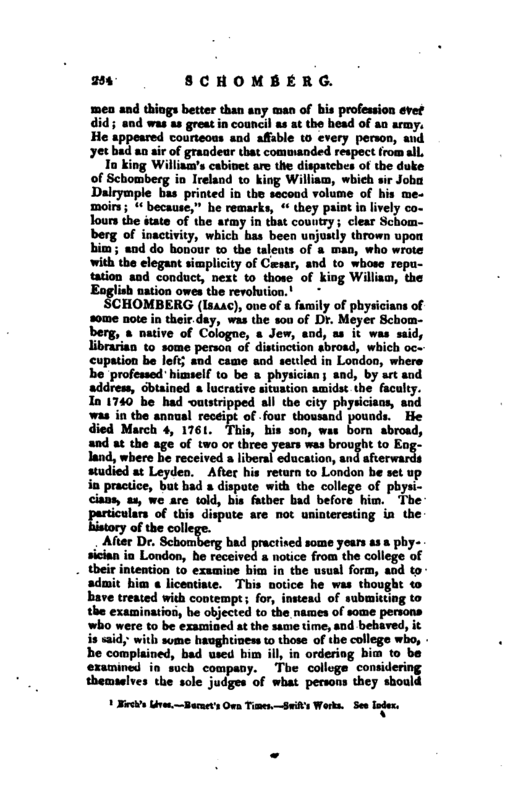 Schomberg, therefore, being disappointed of the supplies from England, which had been promised him, and his army being so greatly inferior to the Irish, resolved to keep himself on the defensive. He lay there six weeks in a rainy season; and his men, for want of due management, contracted such diseases that almost one half of them perished. He was censured by some for not making a bold attempt; and such complaints were sent of this to king William, that his majesty wrote twice to him, pressing him on the subject. But the duke saw that the enemy was well posted and well provided, and had several good officers among them; and knew that, if he met with a check, his whole army, and consequently all Ireland, had been lost, since he could not have made a regular retreat. The surest method was to preserve hi’s army; which would save Ulster, and although his conduct exposed him to the reproaches of some persons, better judges thought, that his management of this campaign was one of the greatest actions of his life. At the battle of the Boyne, July 1, 1690, he passed the river in his station, and immediately rallied and encouraged the French Protestants, who had been left exposed by the death of their commander, with this short harangue; “Aliens, messieurs, voila vos persecuteurs,” pointing to the French Papists in the enemy’s army. But these words were scarcely uttered, when a few of king James’s guards, who returned full speed to their main body, after the slaughter of their companions, and whom the French refugees suffered to pass, thinking them to 1 be of their own party, fell furiously upon the duke, and gave him two wounds over the head, which, however, were not mortal. Upon this, the French regiment acknowledged their error by committing a greater; for, firing rashly on the enemy, they shot him through the neck, of which wound he instantly died. He was buried in St. Patrick’s cathedral, where the dean and chapter erected a small monument to his honour, at their own expence, with an elegant inscription by Dr. Swift, which is printed in the Dean’s works. Birch’s Lives. Burnet’s Own Times. 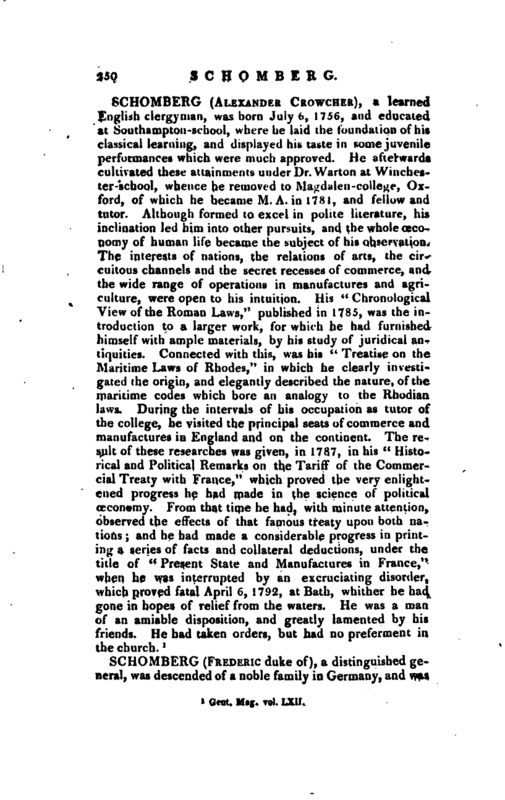 Swift’s Works. See Index.